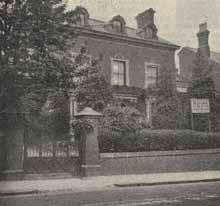 Sycamore House Home for Boys started life as an independent children's home at 37 Highgate Street established by Miss Emma Simcox in 1904. Unfortunately within three years, the existing building had become unsuitable for the children's needs, and the 26 boys aged 7-12 moved to Sycamore House 13, Park Road (left). The Archdeacon of Birmingham dedicated this new Home on 12th February 1907. Regrettably, Miss Simcox passed away on 7th February and a brass tablet was placed in her honour in the Home's hall. At the outbreak of the Second World War, the boys were evacuated to Matlock. After the War the home reopened, and in 1949 it started caring for girls as well as boys. Sycamore House finally closed in 1967. We very grateful to the Moseley Society Local History Group for supplying all the text and the photograph on this page. Please click on the adverts on this page - it helps to fund this site. Thank you!